Wabash Avenue and a portion of Bellaire Drive will be permanently closed within the next two weeks. Image courtesy of TCU administration. 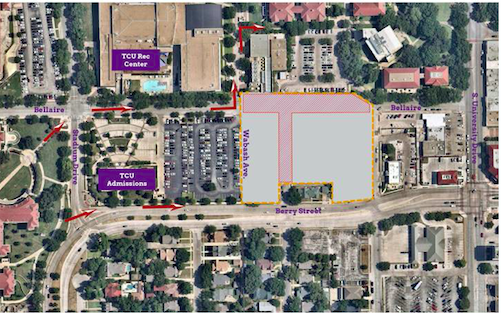 TCU announced the closures of two streets Wednesday as the construction of the new administration building will begin to take place. Wabash Avenue will be permanently closed starting Monday, Feb. 18 and the portion of Bellaire Drive between Rogers Avenue and South Drive will be closed starting the following Monday, Feb. 25. The streets will be closed to both pedestrian and vehicle access. In an email sent out to the student body and all faculty and staf, Sue McClellan, an executive assistant in the administration office, said pedestrian access on the east side of the Rec Center on South Drive will not be impacted by the construction. McClellan also recommended walking on Berry Street to avoid construction. For updates on campus construction and shuttle routes, visit maps.tcu.com.